The RHN Client Portal gives you password-protected access anywhere, anytime to transfer files of any size and view documents such as financial statements, tax returns, invoices, bookkeeping files, and any other reports at your request. For detailed instructions on uploading and downloading on RHN’s Doc. It Client Portal, please see our user guide. Contact us by email or by phone to request your Portal log-in information. You will be provided with a temporary password. Please remember to change your password once you have logged in. It is our Vision to be the Firm of Choice for our valued clients. Thank you for choosing RHN Chartered Professional Accountants. We appreciate your time and feedback! Please rate our service and give us an opportunity to learn how we can improve your satisfaction. Alternatively, please rate us on Google or Facebook. RHN Chartered Professional Accountants is the firm of choice for clients, employees and owners. We commit to providing a professional service to clients and prospective clients of our Firm. We will act with integrity at all times and our clients and prospective clients will be treated with courtesy and respect in their dealings with us. As a registered Public Practice Firm, all of our staff adhere to the strict guidelines and standards set out by the Chartered Professional Accountants Association of British Columbia (CPABC). We will always act in a manner that is professional and courteous when dealing with third parties. RHN accepts Visa and MasterCard through our secure Online Payment page and in-person at any office locations. You may also Contact Us if you would like to submit your card information over the phone, or if you would like to pay by American Express. RHN requires the credit card security code for your card for any online payment transactions. The credit card security code is an individual three or four digit number specific to your credit card that may be printed the back of your card, on the signature panel (if Visa or MasterCard). Asking for and confirming your credit card’s security code helps validate that you – and only you – are in the possession of your credit card and protects you from unauthorized use of your account. RHN will send you a confirmation of your online transaction at the email address supplied by you. To remit payment using personal cheques, company cheques and Money Orders payable to “Reid Hurst Nagy Inc.”, or “RHN”, please mail cheques or Money Orders to any of our office locations. 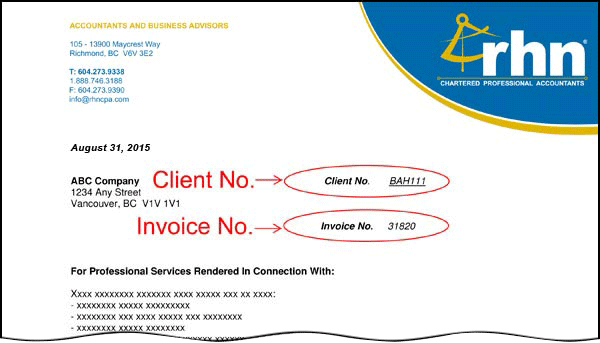 Please clearly write the Invoice Number on the cheque or Money Order to ensure that the payment will be applied to the correct account. Any NSF or other bank charges resulting in a void cheque will be reapplied to the client account as a balance owing. Excess payment or unused retainers will be refunded to the client in a timely manner. Overdue accounts are subject to 1 1/2% per month (18% per annum) service charge. Payments received via online payment will first be applied to the oldest finance charges, and then the invoice amount, if applicable. To accommodate our clients and make our services accessible to anyone who may need them, we will offer services through a range of means including face to face meetings, communication by email, Skype or on the telephone. We will make best use of technology to ensure that our services are as accessible as possible to those who need them. We will ensure that our offices are accessible to people with a physical disability or limited mobility. We will ensure that our services are accessible to all people regardless of their race, religion or ethnic background. We also strive to make our service accessible in terms of its delivery. We will offer appointments as quickly as possible and will respond promptly to all written communication and telephone messages. Wherever possible we will advise clients of the likely timeframe of dealing with their matter and will do our best to adhere to reasonable time limits and deadlines set by clients. If you would like to contact us, we would be pleased to assist you during our regular office hours of 8:30 a.m. to 4:30 p.m. Pacific time Monday to Friday. RHN offices are closed on all statutory holidays. Outside of our office hours, you may submit your communication to us via email, phone messages, fax, or upload documents via our secure Online Portal. Please visit our Contact Us page for more info. At Reid Hurst Nagy Inc. (RHN) Chartered Professional Accountants, respecting privacy is an important part of our commitment to our clients and employees. This means that we will not, without our client’s specific consent, disclose the fact that they have approached the firm or engaged our services. We will at all times operate practices within our offices to ensure that client’s matters are kept confidential. To evaluate whether an engagement will be accepted or entered into, and to provide professional advice and services to you. Usually the scope of advice and service is set out in detail in a formal engagement letter with you. To evaluate, monitor and to assess your tax and accounting requirements, recommend changes to asset structures, recommend changes to liability provisions and risk management, recommend the retainer of other consultants such as brokers, legal counsel and insurance agents, and consult on strategies for items such as tax disputes and inter-jurisdictional arrangements. To evaluate and plan the structure and activities in the course of providing services to our clients which are organizations as mandated by our retainer with them, we will collect information about individual members, shareholders, employees and directors of those organizations. This information is not utilized to review or analyze the personal financial affairs of any of these individuals, unless that is the subject of a separate engagement. To coordinate the collective financial affairs of an individual and organizations if an individual clients also are involved in organizations for which we are separately retained to provide services, as well as to cross-check and verify the accuracy and consistency of information relevant to both engagements. As a general rule, RHN only discloses personal information of our clients as instructed by them. However, there are a number of exceptions. (d) To professional regulatory bodies, as required by legislation, rules, policies or codes governing our profession.